I arrived lugging a large picnic for seven and a garden chair. I have learnt my lesson. Many’s the year I sat cramped and cross-legged on picnic blankets craning to watch my son’s performance. No: you need two things to watch sports day: comfort and elevation. And food. Three things. A fabulous visual spectacle awaited me. The children have four school houses, and each house has a colour. It was like watching a frenzied way ward rainbow pushing boundaries for all it was worth. A chaos rainbow. One child stubs his toe on one side of the playing field and it has a huge augmented effect on the score desk right the other side. It’s a forested school. Think tall pine trees and impossibly small children. Like my nephew, five-year old Big Al. By the time I arrived, Al had already managed to have an adventure. Well, what do you expect, when you give him and egg and spoon? Al, like all his compatriots, is fiercely competitive. And when you stand at the starting line, it seems so straightforward; keep the egg on the spoon, and be the first one across the finishing line. But the starting horn sounded, and Al set off and that naughty egg began to misbehave. It jiggled and agitated and was generally unruly. And somewhere along the way, Al dropped the egg. His mum’s heart was in her mouth. Losing is not Al’s bag, baby. His shoulders slumped, and he prepared for a full-scale demonstration of his disapproval. But all was not lost. For from the sidelines, with lightning reaction speed and a healthy appreciation of what Al will and will not do, shot the head master. Al’s head master is new this year. He’s an action man. 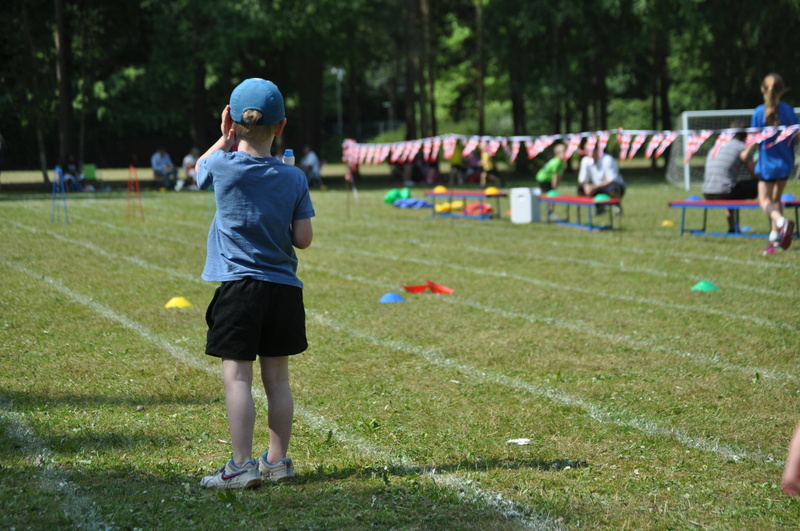 He was at the centre of the exuberant child-rainbow the whole sports day, and the children came first every time. Mums clucked approval. We like his style. Let us call him -for I sense this will not be the last we see of him – Mr Headmasters. Angels sang. Oh, well, Al concluded quickly, if Mr Headmasters is finishing the race, it would be churlish not to. And they ran together, all the way to the finish line. It was a rainbow day. My nieces, those I call the Princesses, each had moments of glory, and looked regal whilst they had them. Felix ran and won the 600 metres and I squeaked with motherly pride. It was everything it should be, this chaos rainbow. Written in response to Side View’s weekend theme: rainbow, which you can find here. Posted in Big AlTagged Big Al, kids, Sports DayBookmark the permalink. I wish I could show more, Sidey; the whole day was just this blaze of colour and kids. Just lovely. We’re all pleased as punch that he has arrived, Fiona! Every school needs a Mr Headmasters – teachers like that are worth their weight in gold. Such strange events, school sports days. I remember, at prep school, we were split up into 4 houses: Eagles, Hawks, Swifts and Kites. I was a Kite, which was a disappointment to me at the time, as all the other boys seemed to be rather dramatic birds.. I do see what you mean, Roger. Kite doesn’t have quite the ring of hawk, does it? But such airmen. Their stunts are fantastic. Well done to all the players, Kate! I’d have enjoyed my sports days a lot more if I’d have been supported like that! Me too, Tom, I always hated sports days. The school is blessed to have someone like Mr. Headmasters who knows just how to help a 5-year old save face and complete his mission without missing a beat. Sounds like a lovely day. Congrats to the fleet-footed Felix! I’ll pass those on, Karen, thanks! This brought back happy memories of Field Day in grade school ~ egg toss, egg spoon races, 3-legged races, wheelbarrow races, softball, and all manner of dashes and relay races. Glad that everyone had such a lovely time. I always hated school sports days, Kate, because I was so awful at sports. Big Al and his headmaster are quite a pair. Good for the Mr for stepping up and averting disaster. A huge virtual hug to that headmaster! That’s a headmaster with quite a heart, Kate. That’s great that he had the mind to come to Al’s rescue so swiftly. Truly, what a guy! What a lovely man is Mr Headmasters! I find picnics and games much more fun with ‘elevation’ – much more graceful getting up! I wonder if Mr Headmasters can be cloned? Well done to all the clan!